I often take time on this blog to rag on pseudoscience... what I term "junk science". The comments and emails I receive are typically heavily populated by New Agers who take me to task for always siding with the "establishment" against their wide-eyed acceptance. Well, the truth is, I don't always side with the establishment. There are fads in science, and I recognize those, too. In fact, I'm going to do it today. I also reserve a little bit of space for my own "wide-eyed acceptance." The topic is the Fermi Paradox..
OK, ok, so this post has nothing to do with Darkseid. But he's always searching for the "Anti-Life Equation", which is never actually defined, but which I think is a pretty good alternate name for "The Great Filter", which seeks to explain why the observable Universe isn't teeming with Life. So I've appropriated it as the title of this post. Sorry if I suckered you in here. Every so often the topic of extraterrestrial Life raises its head, and at those times various equations are offered to demonstrate the likelihood of that occurrence. It happened again today in a post on ArsTechnica.com. Titled "Habitable Planets are Bad News for Humanity," it postulates that if there's life on newly discovered exoplanets, our chances of killing ourselves off may increase in the future. But that's a pretty big leap... let's back up a step. Let's start from the ground up. In the 1950s some scientists at Los Alamos National Laboratory were discussing the probability of there being extra-terrestrial life. Enrico Fermi did some "back of the envelope" style calculations and determined that ETs should be fairly common. Realizing that his expectations didn't match his observations, he shouted, "Where are they?" A decade later, Frank Drake came up with what became known as "The Drake Equation", which ran along the same lines as Fermi's. However, Drake had the distinction of sharing his equation [link]. It takes into account such things as the rate of star formation, the percentage of stars having habitable planets, the chance of life of any sort arising on those planets, the evolution that life, and the chance that it invents technologies (such as radio) that we can detect). You should know that there is nothing whatsoever useful or scientific about the Drake Equation. It is nothing more than a collection of unknown and unknowable assumptions strung together using the language of mathematics. Its main value is in stimulating conversation on the topic. However, that doesn't stop most people from treating it with the same sort of respect they give E=mc2, although that respect is wholly unearned. Using some optimistic assumptions, no less than Carl Sagan suggested that there might be as many as a million technologically advanced, communicative civilizations in the Milky Way alone. Some scientists dissent, but a fair number nod their heads and echo, "Yep, there must be." This is a comforting fiction to a scientist, because it falls well within the danger zone we call "confirmation bias". You can look that up yourself, but basically, that's the tendency of human beings to favor information that confirms their preconceptions, and to discard information that does not. Anecdotes and confirmation bias form the basis most of the pseudo-science that irks me, so I'm not about to let Carl Sagan slide. Scientists aren't immune. I'm going to indulge in a little speculation myself, and point out that there's a well-established tendency toward atheism among modern scientists. Among atheists, it's rarely enough to disbelieve in a God... those who believe in a God must be shown to be wrong about... well... nearly everything. And since a basic principle of most religions is that Man is special in the cosmos, then that must be wrong, too. In television programs like "Cosmos: A SpaceTime Oddysey", great pains are taken to illustrate how small, insignificant, and utterly un-remarkable we humans are in the immensity of the Cosmos (Some Christian apologists are having fits over it). Nevertheless, there remains the Fermi Paradox. Where is everybody?!? It's not a glib question, and it's not an easy one to answer. The Universe appears to be around 13 to 14 billion years old, to the best of our observations. Our star is relatively young by comparison; only about 4.5 billion years. We humans are younger still; a mere smattering of thousands of years old. And yet we stand on the brink of space travel. In all the billions of years of prior existence, if there were only one technological civilization, it should have pretty thoroughly colonized the Milky Way within 100 million years or so of gaining the ability of interstellar travel, even at sub-light speeds. Everywhere we turn an antenna we should be receiving radio signals. Perhaps they would carry the voices of long-dead entertainers, just as The Lone Ranger is still galloping across the galaxy, having first left the paddock called Earth in the 1933. Even if life were far less ubiquitous than we thought, it should be common. We should detect it's presence along the densely populated plane of the Milky Way. In fact, we have heard nothing. Absolutely nothing. Despite deliberate attempts to seek out what scientists believe should be commonplace, we've come up completely, utterly, and embarrassingly empty. There just doesn't seem to be anything out there, and this is called "The Great Silence", which is just a way of saying, "Fermi's got a point... where is everybody?" I would go so far to say that if it weren't for confirmation bias and anti-religious pre-conceptions, every scientific investigation into extra-terrestrial life thus far has indicated that we are special. The scientists among you should understand that this isn't some Young-Earth Creationist rant. We are... so far as we can tell... entirely unique in this Universe. The exceptional-ism of life on Earth is one thing that Religion appears to have gotten right. Whether we decide to take a leap of faith or invoke the Anthropic Principle, that rarity isn't something we should lightly toss aside. Every known example of every living thing in the history of Time is on this ball of mud we call home. OK, so somewhere along the line, something is wrong with one or more of the assumptions in that Drake Equation. We not only don't see as much life as predicted, we don't see any. None at all. Why? The Great Filter basically pre-supposes that the Drake equation isn't terribly bad... Life surely must be everywhere, despite what we haven't seen... but that civilizations kill themselves off before we get a chance to pow-wow. Naturally, that's an over-simplification, but it contains the guts of it. Some speculative reasons include that other civilizations are too aggressive, too self-destructive, too far away; or that they arose too early or too late for us to detect, or that we're just not listening properly. None of this speculation is terribly optimistic. Remember, we've heard absolutely nothing. This implies that every time that civilization has ever been attempted anywhere, by any species, it has ended in disaster (unless the successes are so far away that the evidence hasn't reached us). Indulgence in this line of thought would indicate that the Last Days aren't just idle speculation. Sorry, couldn't resist, but I'm serious. So far, we can only believe in extra-terrestrial civilizations through blind faith, for there is no other evidence. And if we take it on faith that they existed, and take it on faith that the lack of evidence is because they cease to exist before we can detect them; then it would seem that for lo these many years, religions have been completely right to warn against final conflicts like Ragnarok, or Armageddon, or Frashokereti, or Yawmid Din, or Acharit Hayami, or Pralaya, or what-have-you. Maybe the details are up for debate, but it would seem that these scientists are siding with Bronze-age priests to argue that every civilization faces a terminal conflict. In truth, we know of none who have survived. We could be the very first civilization to make it this far. The possibility is real enough that some science-minded people are fervently hoping that we never find extraterrestrial life. This brings us back to the ArsTechnica article. You see, since we know of exactly no extra-terrestrials with sentience and technology, the fact that we ourselves have attained both is extremely good news. We've gotten farther than anyone else, and we haven't died yet. It is therefore possible that we have beaten the Great Filter, and will live long, happy lives into a bright Utopian future. If we find just one more civilization like us (so the reasoning goes), then we're back in hot water. For then we're not unique in the Universe, and we are back to explaining why we've detected absolutely no one else, without the comforting possibility that we're the first to make it this far. That increases the chance that our disaster is yet-to-come, and there will be an Armageddon. 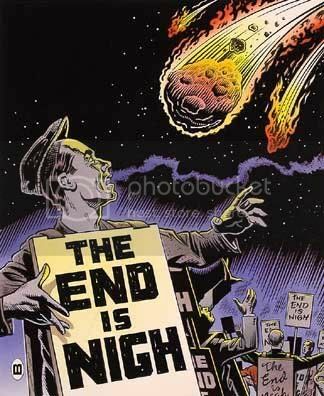 We may yet see astrophysicists standing on street corners wearing sandwich boards that read "The End Is Nigh". I am religious. That is the space that I've reserved for my "wide-eyed acceptance". However, I'm content to know nothing of the "true nature" of God. If God is God, that would be a futile exercise of hubris. There are a lot of conflicting religions in the world, and not everyone can be right. Those that are right can't be right about everything, for some of what they teach conflicts with Nature. I am, therefore content to interpret the "books of revelation" as being figurative and the "book of nature" as being literal with respect to physical matters. There is only one book of nature, and we are all subject to natural law irrespective of our beliefs. Forget the rest of the Universe for a moment, and let's narrow our search for intelligent life to just one place... the only place we know life of any kind to have arisen... the planet Earth. Evidence indicates that Life on Earth arose some 3.7(ish) billion years ago. That's rather early in the existence of this planet. However, it took a billion years for a singular event to occur... a bacterium invaded a cell and rather than get digested, it took up residence. It became the fore-runner of mitochondria. All multi-cellular organisms are eukaryotes, descended from this union. And animals that we'd recognize as animals (jellyfish)...? They've only been around for about 570 million years. Homo sapiens have been around less than 200,000 years, or about 0.005% of the total. Humans lived without any durable civilization for all but the last 10,000 years or so. Nearly all of our technological advances have occurred within the last 150 years. Furthermore, evolution doesn't favor intelligence. There is no "evolutionary ladder". Even if every condition is right for intelligent life, it won't arise if there doesn't exist the need for it and the mutation to take advantage of that need, at the same time. Even on a planet as supremely hospitable as Earth, with myriad species for raw material, plenty of competition, and billions of years, technologically advanced creatures have only appeared once. Let that sink in. Even if Life itself is common, simply getting to multi-celled organisms is hard. Getting those organized is harder still. And even when you have all the intelligence you need, technology doesn't necessarily follow. It took us a long time to get there. But when a breakthrough happens, it happens fast. Ours is a "Population I" star. Its components were gathered from a dust cloud that contained a rich amount of heavy elements such as uranium. These elements were formed in the explosions of supernovae from previous generations of stars. Because Sol is a Population I star, the planets that surround it (formed from that same dust cloud) also are rich in heavy elements. The presence of radioactive materials could have had a hand in promoting mutations without burning us up. Certainly, our body chemistry depends on elements that are heavier than iron. Chemistry like ours could not have existed in the early Universe, and Earth contains enough precious metals to plate the planet to a depth of 4 meters. Our planet has a molten core of iron, that enables it to generate a strong magnetic field, shielding us from cosmic rays. A little radiation is good for evolution, but a lot of it will yield a barren rock. Look at Venus, Mars, and the Moon... all in the habitable zone. Ours is a double planet. Our abnormally large Moon causes tides that would have encouraged the evolution of amphibians and land-dwellers. Without tides it's less likely that animals would ever have left the seas. Our Moon was much closer in ancient pre-history, and the tides much stronger. "Missing your bus" when the tide went out wasn't a trivial matter. Also, the Moon stabilizes Earth's rotation. Earth's axis wobbles, but not erratically as it might without the Moon. We have a lot of water. This stuff is practically a miracle liquid. It dissolves most substances, exists in solid, liquid, and gaseous forms within a narrow range of temperatures (and at the same temperature! ), and is necessary for organic chemistry. So we're on a planet with stable rotation, at the right temperature, shielded from cosmic radiation, having just enough heavy elements of the right kind, and having liquid water seas with strong tides. I can count on one finger the number of planets we've found that fit that description. You're standing on it. The fact that we're not orbiting a first- or second-generation star is significant, in my opinion. Chemistry like ours could not have existed in the early universe, so I think it's -- not entirely, but somewhat -- misleading to offer up the age of the Universe as a variable. Properly, it would be the availability of Population I stars with rocky planets in the habitable zone. In any event, with these factors in mind, I have no problem at all with the idea that we may be among the first sentient, technologically advanced lifeforms in the observable Universe. There may be others, for if the time is ripe here, it may be elsewhere; but it wouldn't surprise me that their radio waves haven't reached us yet. Our own have only had time to spread some 90 light-years. And if we do find others? What then? Well, I wouldn't cringe with fear of the Anti-Life Equation (the Great Filter). No. If we're "among" the first, then so would they be. Somebody has to be in the first class. At the very least, when science confirms the possibility of a global conflict predicted by religion, it's probably a good idea to get our houses in order so our fears don't become self-fulfilling prophecies. And speaking of prophesies... science nerds, this is one area where you owe the "religious nuts" a bit of respect. They have the cajones to admit they believe in the exceptionalism of Mankind and an impending battle at the End of Days on faith. If you're proclaiming that the sky is full of aliens that we can't detect because they've offed themselves in an inevitable conflict, you're doing the same thing. I link heavily to Wikipedia here. This is not a scientific treatise or term paper (I used a picture of Darkseid, for Pete's sake). The links are for your benefit, not mine. Wikipedia is generally clearly written, and if it isn't then there are folks (like me, occasionally) who go in and fix it. It's also well-referenced. Wikipedia is not the end stop in a quest for references, but it's can be the beginning of a discussion. If you need more than a cursory understanding of a subject, dig in to the references there until you're satisfied. Really, folks, if you're complaining about the use of Wikipedia, it's an extremely strong indication that you don't know how to use any reference, and shouldn't be on the Internet without adult supervision. Elements heavier than iron that are required by the human body include Cobalt, Copper, Nickel, Zinc, Selenium, Molybdenum, and Iodine. Arsenic is also required in trace amounts, but we don't know why. We do know, however, that completely removing arsenic from the diet of test animals caused them to become ill.. I know what you're thinking... "What about Europa?" Keep in mind we're looking for technologically advanced civilizations, not algae or fish. Europa has more water than Earth, and we think it's kept liquid by friction from the tidal forces exerted by Jupiter and its other moons; but it's also bathed in severe amounts of ionizing radiation. For life as we know it to remain stable, it would have to live beneath that thick ice sheet, which means no fire, and therefore no metallurgy, and therefore no technology that we could recognize. It is distinctly possible that sentience is the result of sexual selection and is only incidentally a survival advantage. As sexual selection is arbitrary, even if all conditions are perfect and the opportunity and the mutation present themselves, it won't do any good unless somebody thinks a big brain is sexxxy.